Our year-end party for IRIS Orchestra’s 20th season looks forward while celebrating our past. Twenty-five years old and new on the scene, American violinist Nancy Zhou will perform Tchaikovsky’s emblematic Violin Concerto. 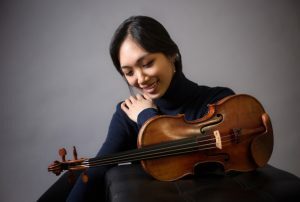 Her rendition of the piece won her the Shanghai Isaac Stern International Violin Competition in 2018. Opening the program is a composition specially commissioned in celebration of our 20th anniversary, a gift from our good friend Jonathan Leshnoff, the Baltimore-based composer distinguished by The New York Times as “a leader of contemporary American lyricism.” We return to our roots to conclude our 20th season the same way we ended our first: with Mendelssohn’s Symphony No. 3, the “Scottish.” Happy Birthday, IRIS!